The thyroid gland is a large gland located in the neck, where it is attached to the trachea just below the larynx (see Fig. 10.1). The parathyroid glands are embedded in the posterior surface of the thyroid gland. The thyroid gland is composed of a large number of follicles, each a small spherical structure made of thyroid cells filled with triiodothyronine (T3), which contains three iodine atoms, and thyroxine (T4), which contains four iodine atoms. To produce triiodothyronine and thyroxine, the thyroid gland actively acquires iodine. The concentration of iodine in the thyroid gland can increase to as much as 25 times that of the blood. If iodine is lacking in the diet, the thyroid gland is unable to produce the thyroid hormones. In response to constant stimulation by the anterior pituitary, the thyroid enlarges, resulting in a simple goiter (Fig. 10.5). Some years ago, it was discovered that the use of iodized salt allows the thyroid to produce the thyroid hormones, and therefore helps prevent simple goiter. Thyroid hormones increase the metabolic rate. They do not have a target organ; instead, they stimulate all cells of the body to metabolize at a faster rate. More glucose is broken down, and more energy is utilized. Figure 10.5 Simple goiter. An enlarged thyroid gland is often caused by a lack of iodine in the diet. Without iodine, the thyroid is unable to produce its hormones, and continued anterior pituitary stimulation causes the gland to enlarge. If the thyroid fails to develop properly, a condition called cretinism results (Fig. 10.6). Individuals with this condition are short and stocky and have had extreme hypothyroidism (undersecretion of thyroid hormone) since infancy or childhood. Thyroid hormone therapy can initiate growth, but unless treatment is begun within the first two months of life, mental retardation results. The occurrence of hypothyroidism in adults produces the condition known as myxedema, which is characterized by lethargy, weight gain, loss of hair, slower pulse rate, lowered body temperature, and thickness and puffiness of the skin. The administration of adequate doses of thyroid hormones restores normal function and appearance. In the case of hyperthyroidism (oversecretion of thyroid hormone), as seen in Graves disease, the thyroid gland is overactive, and a goiter forms. 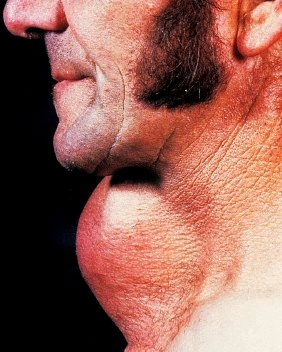 This type of goiter is called exophthalmic goiter. The eyes protrude because of edema in eye socket tissues and swelling of the muscles that move the eyes. The patient usually becomes hyperactive, nervous, and irritable, and suffers from insomnia. Removal or destruction of a portion of the thyroid by means of radioactive iodine is sometimes effective in curing the condition. Hyperthyroidism can also be caused by a thyroid tumor, which is usually detected as a lump during physical examination. Again, the treatment is surgery in combination with administration of radioactive iodine. The prognosis for most patients is excellent. Figure 10.6 Cretinism. Individuals who have hypothyroidism since infancy or childhood do not grow and develop as others do. 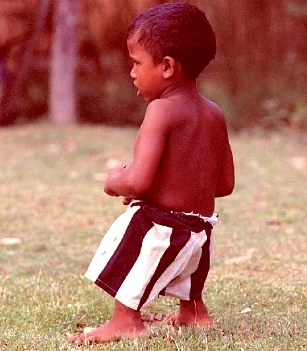 Unless medical treatment is begun, the body is short and stocky; mental retardation is also likely. Calcium (Ca2+) plays a significant role in both nervous conduction and muscle contraction. It is also necessary for coagulation (clotting) of blood. The blood calcium level is regulated in part by calcitonin, a hormone secreted by the thyroid gland when the blood calcium level rises (Fig. 10.7). The primary effect of calcitonin is to bring about the deposit of calcium in the bones. It does this by temporarily reducing the activity and number of osteoclasts. When the blood calcium lowers to normal, the release of calcitonin by the thyroid is inhibited, but a low calcium level stimulates the release of parathyroid hormone (PTH) by the parathyroid glands. 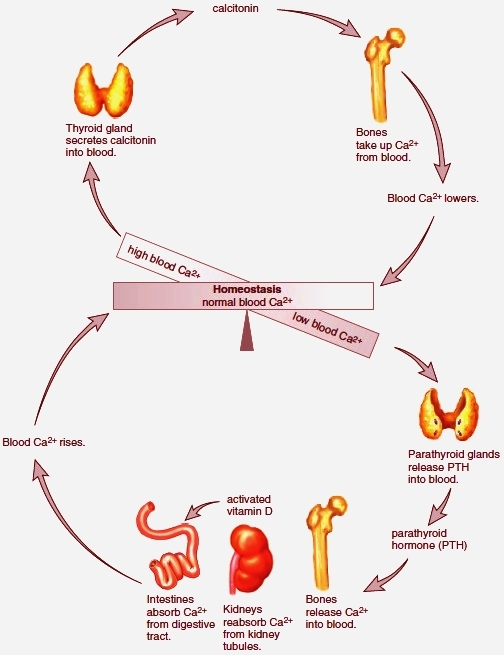 Parathyroid hormone (PTH), the hormone produced by the parathyroid glands, causes the blood phosphate (HPO42-) level to decrease and the blood calcium (Ca2+) level to increase. The antagonistic actions of calcitonin, from the thyroid gland, and parathyroid hormone, from the parathyroid glands, maintain the blood calcium level within normal limits. Note in Figure 10.7 that after a low blood calcium level stimulates the release of PTH, it promotes release of calcium from the bones. (It does this by promoting the activity of osteoclasts.) PTH promotes the reabsorption of calcium by the kidneys, where it also activates vitamin D. Vitamin D, in turn, stimulates the absorption of calcium from the intestine. These effects bring the blood calcium level back to the normal range so that the parathyroid glands no longer secrete PTH. Many years ago, the four parathyroid glands were sometimes mistakenly removed during thyroid surgery because of their size and location in the thyroid. Figure 10.7 Regulation of blood calcium level. Top: When the blood calcium (Ca2+) level is high, the thyroid gland secretes calcitonin. Calcitonin promotes the uptake of Ca2+ by the bones, and therefore the blood Ca2+ level returns to normal. Bottom: When the blood Ca2+ level is low, the parathyroid glands release parathyroid hormone (PTH). PTH causes the bones to release Ca2+. It also causes the kidneys to reabsorb Ca2+ and activate vitamin D; thereafter, the intestines absorb Ca2+. Therefore, the blood Ca2+ level returns to normal. When insufficient parathyroid hormone production leads to a dramatic drop in the blood calcium level, tetany results. In tetany, the body shakes from continuous muscle contraction. This effect is brought about by increased excitability of the nerves, which initiate nerve impulses spontaneously and without rest.